When I was in graduate school, I was privileged to be able to visit Venice and subsequently the island of Murano, famous for its glass-making. I was fascinated watching glass-blowing and instantly wanted to quit painting for that discipline. Unfortunately, I found that you can’t be a glass blower in your living room/studio. But my fascination with all sorts of art glass has persisted. What really amazes me is that glass has survived intact since the Roman Empire and that glass as an art form only dates from the first century BCE. What artists do you think of who are famous for glass art? Louis Comfort Tiffany, Dale Chihuly, or Dominic Labino? Glass is believed to have been first shaped into mold-formed vessels in ancient Phoenicia around the 4th millennium BCE. The earliest Egyptian glass vases date to around 1500 BCE. Glassblowing was invented in the Syro-Palestinian region during the early first century BCE, and is thought to have come to the Roman world on their annexation of that region in 64 BCE. Large numbers of glass objects are not evident in central Italy until the beginning of the first century CE. The Roman glass industry arose and reached full maturity within a couple of generations during the first century CE. 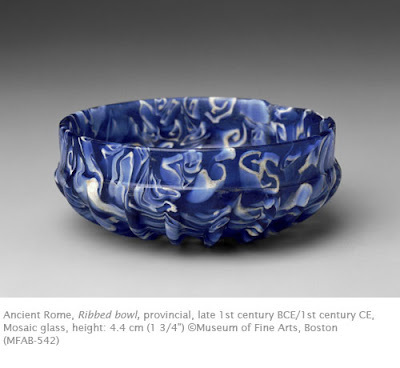 Although blown glass dominated the Roman glass industry, it by no means supplanted the earlier Roman technique of cast glass, evident in this bowl. By the end of the early imperial period (c284 CE), sophisticated blown and cast glass objects were part of Roman daily life from the morning to the evening. In fact, the production of Roman native clay cups, bowls and beakers declined during the reign of Augustus. By the mid-first century, the popularity of glass had caused clay vessel production to cease entirely. The most common manner of casting glass was pouring molten glass over a core mold and shaping it. The Romans adopted and adapted various color and design schemes from the Greeks. A distinctly Roman innovation in glass was marbled mosaic glass, such as this piece. This effect was achieved by fusing small, mosaic-like pieces of cane into a marble pattern. Ribbed objects such as this bowl were the most highly prized type of style, because its form resembled such luxury items as expensive rock crystal objects. The Toledo Museum has a huge collection of glass from antiquity to the present. The Corning Museum of Glass is a world-renowned glass museum in Corning, New York. Discover many examples of glass from ancient to contemporary in the Davis Art Images archives. Nice blue piece. Have a look at the same process in translucent porcelain. dorothyfeibleman Your bowl was listed as nerikomi Nerikomi is a contemporary kanji used in Japan to describe work which is caned like glass.